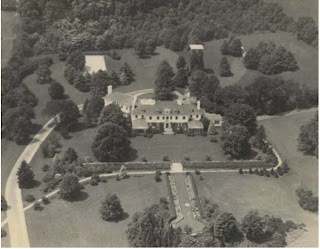 'Loewmoor', originally the Charles Albert Stevens estate c. 1896 named 'Annondale' and subsequently owned by Charles Tracey Barney and then William Goadby Loew with 1934 alterations by Walker & Gillette in Old Westbury. Click HERE for more on the estate which has since been demolished. Photo from the Aiglon Archives. William Goadby Loew, whose father-in-law was the great George F. Baker, summered at 'Stoneacre' in Newport. Likewise demolished, it stood on Bellevue Avenue south of 'Vernon Court'. Loew was a member of the Reading Room, Clambake, Spouting Rock Beach Association ( Bailey's Beach ), and Newport Country clubs. His winter addresses were at 262 Madison Avenue and Old Westbury. By the way, his Newport phone number was 259 ~ these days it would be 401-847-0259, but I doubt that you would find him at home. I always wonder how long it must have taken the gardeners of these big estates to keep these massive lawns manicured with the old type of mower.